Please click on the GEO accession number below to download the data from GenBank. Please click on the protocol name to download the pdf file. This section provides software used or developed for the analysis of large datasets. Metabolic pathway enrichment analysis: Genes represented on the ATH1 GeneChip were annotated according to metabolic pathways described in the PATHWAYS database from AraCyc (http://www.arabidopsis.org/biocyc/index.jsp; 2008 download). Enrichment was defined as the ratio of (i) the number of AGI locus identifiers in the query list annotated as belonging to a pathway to (ii) the number of AGI locus identifiers associated with the pathway in the GeneChip compared with the ratio of (iii) the total number of AGI locus identifiers present in the query list to (iv) the total number of AGI locus identifiers present on the GeneChip. DNA motif enrichment analysis: Gene sets were analyzed to identify enriched DNA sequence motifs known to interact with TFs (Arabidopsis Gene Regulation Information Server, http://arabidopsis.med.ohio-state.edu/, August, 2009) that are located in the region 1 kb upstream of the gene's transcription start site (TAIR9, www.arabidopsis.org) as described by others (O'Connor et al., 2005; Vandepoele et al., 2009). The background distribution was determined by identifying DNA motifs for all genes represented as singletons on the Arabidopsis ATH1 GeneChip. Statistical enrichment (p value < 0.001) was determined for each gene list using the hypergeometric distribution. Enriched DNA sequence motifs are also identified among genes overrepresented for a GO term within a gene list. Putative Transcriptional Modules: To discover putative transcriptional modules, we associated significantly enriched DNA sequence motifs with transcription factors known or predicted to bind the motifs. We used known interactions between transcription factors and DNA motifs specified in AtcisDB (Davuluri et al., 2003) and defined by others in the literature and assumed that transcription factors of a particular family bind to the same DNA motif (Brady et al., 2007). Two variations of this approach were used. In the first approach, we associated DNA motifs significantly enriched within a coexpressed gene set with their cognate TFs that were included in the coexpressed gene set. In the second, we identified DNA motifs that were significantly enriched for genes corresponding to an overrepresented GO term and associated coexpressed TFs known or predicted to bind the enriched DNA motifs. Using the software package, ChipEnrich (see below), overrepresented GO terms, DNA motifs, and their associated TFs were compiled into two Cytoscape compatible files that were used as network and node attribute files, and the modules are visualized with Cytoscape. Data Output: Outputs are summarized in a text file, significant.txt, in which the gene set name is in the first column, enriched GO terms, DNA motifs, or transcription factor families are listed in the second column, and p values indicating the significance of enrichment are given in the third column. Each new enriched category is set in a new row. If a DNA motif is significantly overrepresented within a gene list (p < 0.001), it is also determined if the motif is enriched among genes significantly overrepresented for a GO term (p < 0.001). In the significant.txt file, the overrepresented GO terms are listed in the first column, enriched DNA motifs are in the second column, and p values are in the third column. TFs in the gene list (first column) that are predicted or known to bind with enriched DNA motifs (second column) are also listed in the file. A separate node attribute file is also provided from ChipEnrich that describes whether a node (first column of significant.txt file) is a pattern, GO term, DNA motif, transcription factor family, or transcription factor. The significant.txt file is designed to be used as the network file for the network graphing software, Cytoscape (version 2.6.3, http://www.cytoscape.org.). The node.txt file is used as the attributes file (Cline et al., 2007). P values are also imported with the network file as edge attributes. For visualization purposes, a thicker line represents a lower p value, a dashed line represents a TF with a predicted binding interaction, and a solid red edge is an experimentally determined TF - DNA motif interaction. Brady, S.M., Orlando, D.A., Lee, J.Y., Wang, J.Y., Koch, J., Dinneny, J.R., Mace, D., Ohler, U., and Benfey, P.N. (2007). A high-resolution root spatiotemporal map reveals dominant expression patterns. Science 318, 801-806. Cline, M.S., Smoot, M., Cerami, E., Kuchinsky, A., Landys, N., Workman, C., Christmas, R., Avila-Campilo, I., Creech, M., Gross, B., et al. (2007). Integration of biological networks and gene expression data using Cytoscape. Nat Protoc 2, 2366-2382. Davuluri, R.V., Sun, H., Palaniswamy, S.K., Matthews, N., Molina, C., Kurtz, M., and Grotewold, E. (2003). AGRIS: Arabidopsis gene regulatory information server, an information resource of Arabidopsis cis-regulatory elements and transcription factors. BMC Bioinform 4, 25. Gadbury, G.L., Garrett, K.A., and Allison, D.B. (2009). Challenges and approaches to statistical design and inference in high-dimensional investigations. Methods Mol Biol 553, 181-206. O'Connor, T.R., Dyreson, C., and Wyrick, J.J. (2005). Athena: a resource for rapid visualization and systematic analysis of Arabidopsis promoter sequences. Bioinformatics 21, 4411-4413. Orlando, D.A., Brady, S.M., Koch, J.D., Dinneny, J.R., and Benfey, P.N. (2009). Manipulating large-scale Arabidopsis microarray expression data: identifying dominant expression patterns and biological process enrichment. Methods Mol Biol 553, 57-77. Vandepoele, K., Quimbaya, M., Casneuf, T., De Veylder, L., and Van de Peer, Y. (2009). Unraveling transcriptional control in Arabidopsis using cis-regulatory elements and coexpression networks. Plant Physiol 150, 535-546. To study the functions of transcription factor genes active during soybean seed development, we collaborated with Dr. David Somers (Monsanto) to generate a collection of soybean seed RNAi knock-out lines. 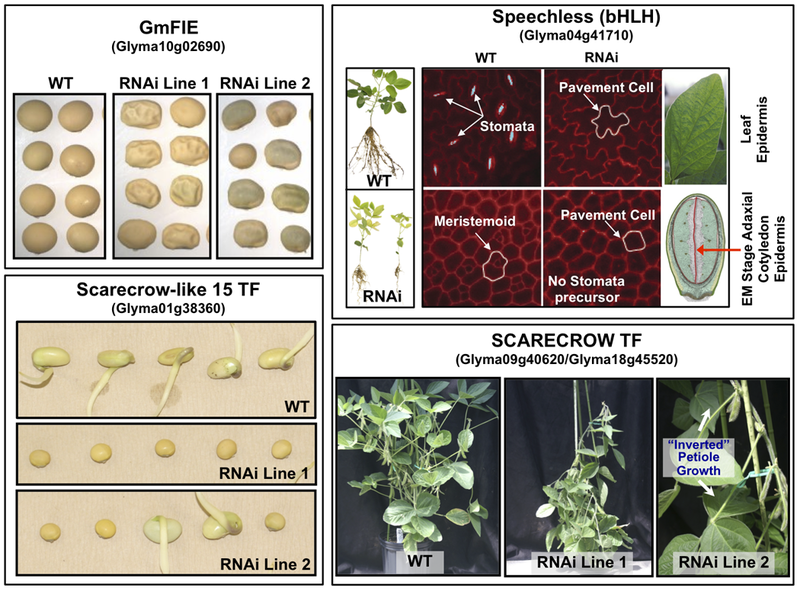 We used the CaMV 35S gene promoter to generate RNAi lines for 63 transcription factor genes that are expressed in specific seed regions at the globular, heart, cotyledon, and early-maturation stages of development. RNAi transgenes were integrated into the soybean genome, and R0 lines containing a single RNAi transgene were isolated and grown to maturity in the greenhouse. The developing R1 and R2 seed populations were screened for developmental abnormalities associated with seed and vegetative development. A preliminary screen yielded three lines with significant phenotypes. The remainder appeared similar to wild type under our screening conditions. 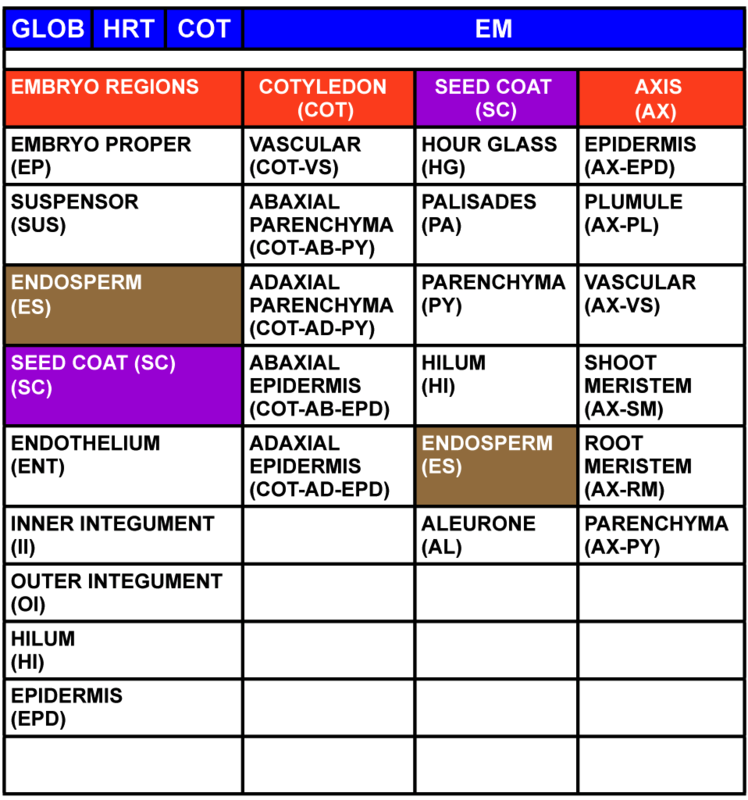 A list of each transcription factor gene knock-out line, their seed expression profile, and RNAi phenotype is presented in the table below. John Danzer, Eric Mellott, Anhthu Q. Bui, Brandon H. Le, Patrick Martin, Meryl Hashimoto, Jeanett Perez-Lesher, Min Chen, Julie M. Pelletier, David A. Somers, Robert B. Goldberg and John J. Harada, Down-Regulating the Expression of 53 Soybean Transcription Factor Genes Uncovers a Role for SPEECHLESS in Initiating Stomatal Cell Lineages during Embryo Development, Plant Physiolgy 2015 Jul;168(3):1025-35. doi: 10.1104/pp.15.00432. Click here to see the abbreviation of stages and compartments. To find the expression profile of target genes during seed development, first go to the "Browse Soybean mRNAs Profiling Database" page. Next, type the target gene name (e.g. Glyma04g41710), in the "Predicted Gene Model ID" window and click the "Submit Query" button to search the database. Lastly, in the search results page, click on the probe set corresponding to the target gene to view the expression profile. Sequences used for BLAST came from the Affymetrix Soybean target sequences. Sequence information can be obtained directly from Affymetrix. The Affymetrix Soybean target sequence was based on the NCBI Unigene Build 13 (November, 2003). Probe design was based on the NCBI Unigene Build as well as the Affymetrix in-house clustering algorithm. Affymetrix in-house clustering probes are designated with the prefix "GmaAffx". BLASTX analysis was carried out using soybean target sequences searched against all Arabidopsis proteins (TAIR ATH1_pep_cm_20040228). In our BLAST analysis, we filtered and removed any results with e-value greater than e-02. We selected the top Arabidopsis hit from each BLAST result (sometimes one Soybean sequence can hit many different Arabidopsis sequence) when identifying the corresponding Arabidopsis sequence. The e-value for that hit is displayed in the annotation file. 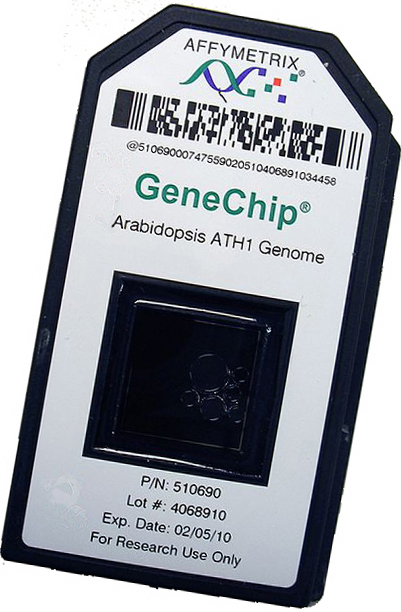 Therefore, for each Soybean probe set, there is an associated Arabidopsis annotation (if available) and the degree of homology between the Soybean and Arabidopsis sequence based on the e-value. In cases where no Arabidopsis hit was identified (~9000 Soybean probe sets did not have homology to any Arabidopsis proteins), we BLASTED the Soybean sequence against Rice Proteins (Build #2 from TIGR) and the NCBI non-redundant protein database. We annotated Soybean probe sets and did not annotate any features from H. glycines or P. sojae that are in the GeneChip. 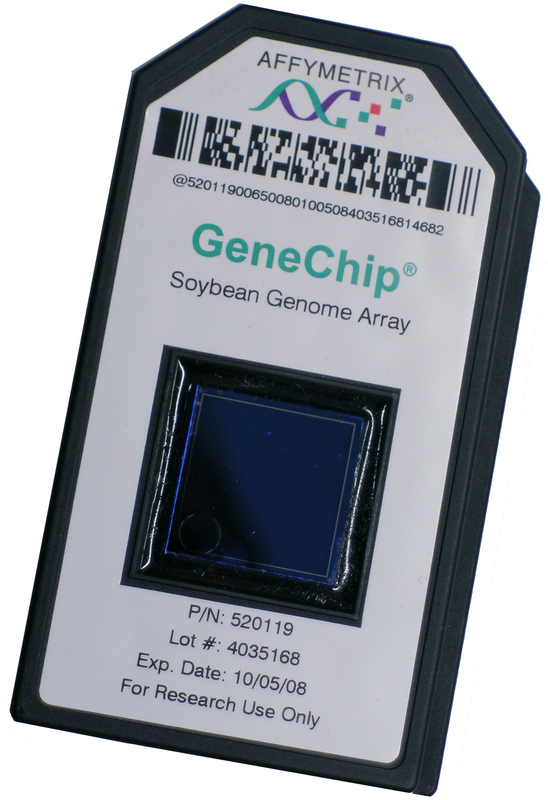 Recently, we annotated the soybean GeneChip to the draft soybean genome sequences (Phytozome.net). Sept. 25, 2009 - We mapped individual probes to soybean predicted gene models (generated by the Department of Energy (DOE) Joint Genome Institute, Glyma version 1.01, released April 7, 2009) using BLASTN (≥ 23/25 nucleotide identity) to associate soybean array probe sets with soybean gene models. Probe sets that contain at least 9 out of 11 probes mapping to the same genomic locus are represented in the files below. Probe sets that did not meet these criteria (i.e. 23/25 nucleotide identity, ≥ 9/11 probes per probe set) were not included in the file below. We split the file into two files based on the confidence of prediction of soybean gene models (ftp://ftp.jgi-psf.org/pub/JGI_data/Glycine_max/Glyma1/annotation/highConfidence/Glyma1_highConfidence.transcriptList). Click the files below to download the association of Soybean array probe sets and Soybean gene models. Feb. 1, 2009 - We updated the annotation of the soybean array information based on information from TAIR 7.0, TIGR, and Peking Transcription Factor databases as of October 2007. The updated information is available from the following link. We created this Soybean Whole Transcript (WT) Array to interrogate all the genes in the genome. The first generation Affymetrix Soybean Genome array was designed by the Soybean Consortium using publicly available soybean full-length cDNAs and ESTs. The Soybean Genome array consists of 37,000 probe sets interrogating ~ 25,000 distinct genes/transcripts. The release of the whole genome sequence of soybean1 (available at Phytozome.net) allowed the creation of an array that can survey all the genes (both high and low confidence gene models) in the genome [Schmutz et al., Nature 463 pp. 178-83 (2010)]. The design of the Soybean WT array is different from the Soybean Genome array. For the Soybean Genome array, probes were selected to correspond to the 3’ end of the transcript or cDNA. However, for the Soybean WT array, probes were selected to span every exon of the predicted gene models/transcripts, if possible. This approach allows for the interrogation of the transcript (from 5’ to 3’) and can help determine exon usage in different splice variants that may be differentially expressed in specific tissues or compartments. For information regarding this array design, please check out other references from Affymetrix (http://media.affymetrix.com:80/support/technical/technotes/gene_1_0_st_technote.pdf). Note: This array was designed for studying both Soybean and Medicago (i.e. a Legume array). There are sequences on the array corresponding to Medicago cDNAs. However, our main focus will be on the Soybean sequences on the array. All sequence data used to design probes on the array were obtained from the Department of Energy - Joint Genome Institute (DOE-JGI) web site (phytozome: http://phytozome.net). Probes were designed from the first draft assembly of the soybean genome1 (version 1.0). The probe selection algorithm was developed by Christopher Davies and Brant Wong at Affymetrix. The array was designed with collaboration from our lab (Goldberg Lab) and Affymetrix with advice and suggestions from other members of the soybean community, including Randy Shoemaker. We've created a text file that correlates Affymetrix probe ID with associated probe sequence, gene and exon information, etc. This array design is available to the general public and can be purchased through Affymetrix. This array was created for our lab and is a custom-designed antisense WT array. Please use the library file and protocols listed below for this array only. This labeling protocol is presented as is and is not regularly supported by the Affymetrix Technical Support team. This method requires an Ambion WT Expression kit, Affymetrix Fragmentation and Terminal Labeling kit, and second strand cDNA synthesis reagents from vendors provided in the attached protocol. For this protocol, you will generate cRNA using the Ambion WT Expression kit (up to Day2 Workflow, Step2). After cRNA synthesis, you will use the Affymetrix protocol (starting on page 9) to make the second cycle cDNA and terminally-labeled targets. For array wash, stain, and scan, use the fluidics protocol EuKGE-WS2v5_450 for wash and stain procedures as described in the GeneChip Expression Analysis Technical Manual (Section 2: Eukaryotic Sample and Array Processing). 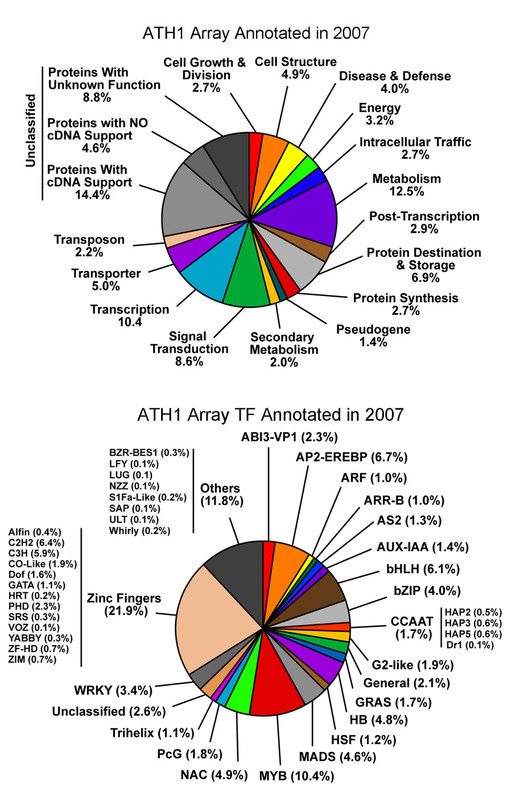 The Arabidopsis ATH1 array was annotated in 2003 using all the publicly available resources at the time. In order to keep up with the increasing amount of information generated within the past four years since the annotation of the ATH1 array, we decided to re-annotate the ATH1 array in parallel with the soybean genome array. 1. We updated the descriptions for each probe set on the array using TAIR Affy array descriptions (affy_ATH1_array_elements-2007-5-2.txt). The description file was downloaded from the TAIR web site: ftp://ftp.arabidopsis.org/home/tair/Microarrays. Descriptions were based on the latest release of the Arabidopsis genome TAIR 7 (released 04-11-07). Note from TAIR: The mapping to the TAIR7 Transcripts was performed using the BLASTN program with e-value cutoff < 9.9e-6. For the 25-mer oligo probes used on the Affy chips, the required match length to achieve this e-value is 23 or more identical nucleotides. To assign a probe set to a given locus, at least 9 of the probes included in the probe set were required to match a transcript at that locus. Otherwise, the probe set was not assigned a locus and was given the description "no match". 2. In addition to updating the descriptions for each probe set, we also updated gene ontology (GO) information provided by Affymetrix. 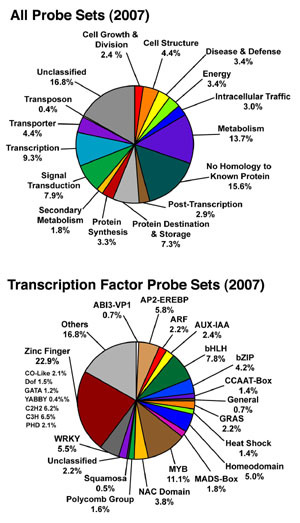 Transcription factors and transcription factor families were associated with each probe set on the array. Information obtained from points 1-3 were compiled together into an annotation file containing the 2003 ATH1 annotations. Transcription factors were automatically updated based on the information obtained from the databases in point 3. 4. We focused on probe sets that were previously assigned into the "unclassified" category. The rationale is that many of the sequences in the "unclassified" category might have update information that can be used to re-assign into a different category. Sequences previously assigned categories of "protein synthesis" or "metabolism" most likely will not change. Therefore, we first focused on re-assigning the 11,145 probe sets classified as "unclassified" in 2003. 5. After the "unclassified" category was re-examined, we decided to re-examine the entire 22,746 probe sets on the array for consistent assignment of functional categories. We sorted all the probe sets by their description and made sure that probe sets with similar descriptions are assigned the same functional category. These files were compiled into one main table listing all the transcripts detected and/or predicted in the Arabidopsis genome. This list helps distinguish if a sequence has cDNA support, represents a pseudogene/transposon, or is unknown. These files help re-assign the probe sets into appropriate unclassified categories. The updated information is available from the following link. Click the image to view larger image. These movies are best viewed in Quicktime. Click here to download Quicktime. To download the video, Mac users: Press CTRL and click on link to download video; PC user: right-click on the mouse and select download.